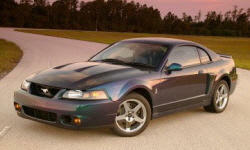 Ford Mustang Price Or Payments Pros and Cons | Page 1 of 1 | Why Not This Car? Die-hard Mustang fans have no desire for any other car. But for non-fans the primary appeal could be the performance of a V8-powered European coupe at a far lower price. I can't believe how reasonably priced this car was. Less than $25k out the door w/ all taxes & other BS ain't bad for a 300hp car that drives this well and this fast. 2 thousand dollars less than its competitors. The 2010 in December was a great price! Even though this is my fun vehicle ( I have eight others, I can easily afford the payments and insurance. Actually, adding this to the "fleet" only added an addition $53 to my six-month premiums. More expensive than the V6, may not be in everyones price bracket. Alot of car "fun to drive" for a really good price. Cheap for the performance level, and cheap to own long term. Very cheap car for the performance and styling even in the 6 cylinder model.